Teaching kids to brush and floss their teeth is just one way you can show your growing children how to take responsibility for their bodies. However, it can be challenging because in general, kids tend to be motivated by fun and pleasure, not by health and necessity. 1) For very young children, you can try making the toothbrush a toy. Let your child play with it, and brush his favourite stuffed toy’s “teeth”; even let him practice brushing yours, so you can show how you don’t mind it at all. 2) Set a good example by brushing your own teeth carefully and thoroughly, and express pleasure in the process. Talk about how refreshed our mouth feels after, and how great it is not to have stinky breath! 3) Consider setting up a reward system. 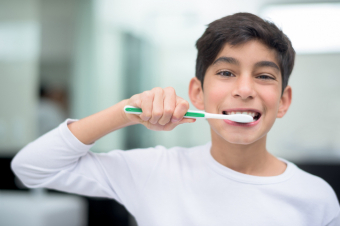 For example, create a calendar where your child can track each brushing session. Once your child has brushed his teeth for a designated number of days (or weeks) in a row, reward him. It doesn’t have to be anything fancy; an extra half an hour of TV before bed, a healthy treat, or a slumber party with friends can all have a motivational effect! 4) Play a catchy song while your child brushes. Many songs last about 2 -3 minutes, so you can challenge your child to brush until the song ends. If you’re having trouble getting your child to brush and floss, we can help! Contact Smile Town Langley today to book an appointment with one of our children’s dentists.